I’d been up late packing and had only made it to bed at 12:30am. When the alarm went off at 4:15am it hurt. I crawled out of bed, took a shower to wake up, and made myself a strong coffee and a bowl of cereal. I finished my packing and made some rolls to eat later. Paranoid I was forgetting something, I checked my packing list over a couple of times. I wasn’t yet properly awake so having the packing list was a comfort. When I had convinced myself all was good I set out. It was already bright out at 5:20am and there was a light drizzle, but not enough to warrant putting the rain cover over the T-bag. 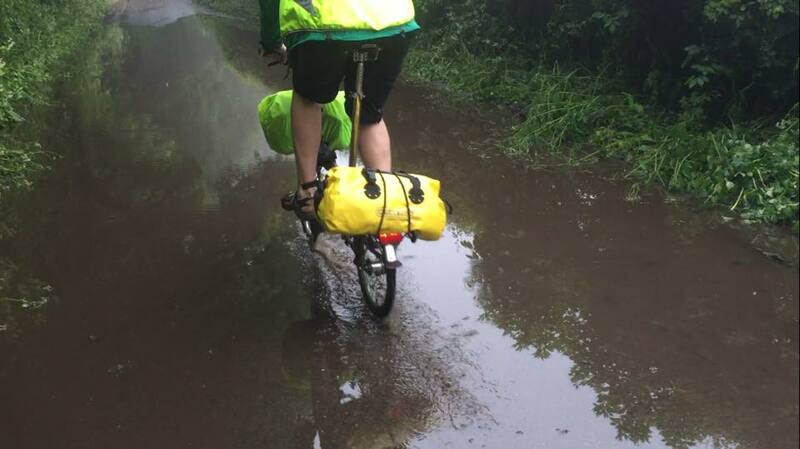 The extra weight of the luggage on the Brompton means it takes a bit of extra effort to get it moving. The handling stays pretty much the same, it just feels a bit meatier. 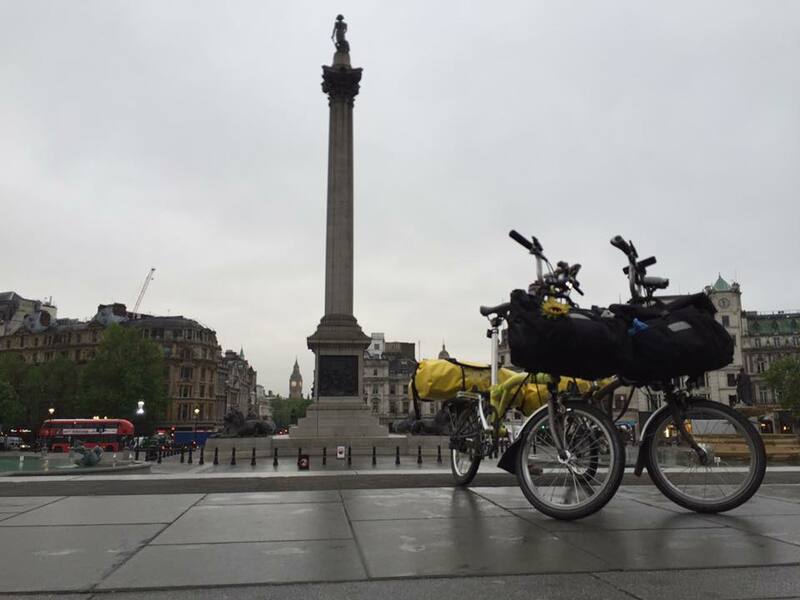 I rendezvoused with Jenny and we reached Trafalgar Square shortly after 6am. This was where we had started last year for the London to Paris ride and it seemed like a good idea to get the tradition going. When planning the route, I’d selected a ride with the Brompton Club Holland as a suitable end-point, which meant leaving London on a Wednesday. So when looking at ferry times I settled on an 8pm ferry from Dover, so that we could get out of London early before rush-hour kicked in properly. This meant we managed to navigate out of London on fast-ish main roads without too much fuss. After an hour or so we took a short break at a petrol station, where I managed to leave one of my brand new water bottles which I had only taken a few sips out of. D’oh! After a few more hours we stopped off at another petrol station to have some food and a drink. Whilst at the petrol station the rain got heavy, but didn’t look like it was going to let up any time soon. We’d have to press on in it. I chnaged out of my Converse shoes (which take a couple of days to dry) and into my sandals. The rain had come down so quickly there was lots of standing water. At one point the rain got so bad we had to pull off the road abruptly and find immediate shelter and wait for the worst to pass. This burst of rain made the conditions worse and the road we were on at the time seemed full of industrial estates and was consequently heavily trafficed by heavy traffic. Not ideal! We eventually left this behind, and the rain began to ease off. At around 1:30pm we found a pub to stop at for lunch – The Windmill in Hollingbourne. It was nice to be somewhere warm out of the rain. Whilst in the pub we did a check on our progress. It seemed we still had a lot of cycling to do, including lots of hills. We’d need to up the pace a little in order to make the ferry. The afternoon was filled with hills and a number of the roads were flooded. It was all good, but the heavy bikes meant it was hard work to attack some of the steep hills. The end of the hills brought a lot of relief. 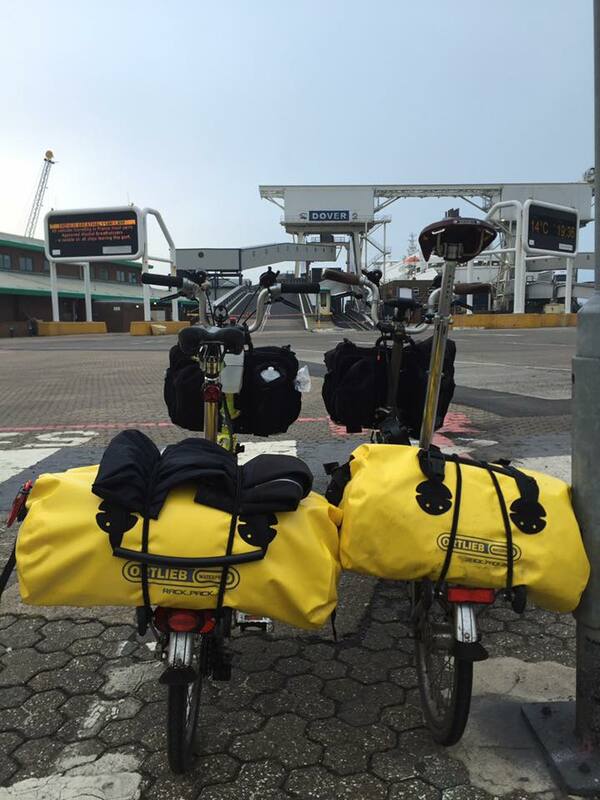 A time check revealed we’d make the ferry ok, and the 10 or so miles into Dover felt like one long downhill. We reached the front of the ferry queue bang on 7:!5pm – precisely the time the ferry company wanted us there. Our ferry was a little late in though, so it meant our crossing was slightly delayed. Getting onto the boat felt great. A sit down, a large dinner and free wi-fi made everything better. The boat docked at around 11:15pm French time. We were the first off the boat. It was dark. We followed the cycle path from the ferry which ran alongside the main road. The ferry had contained very few car or foot passengers – it was pretty much all freight lorries. After we had cycled 10 minutes from the ferry the cycle lane stopped abruptly. Sharing the road with the trucks at night would have been dangerous, so we waited for all of the trucks to go past before we continued. It’s about 12 miles from ferry port to the town of Dunkirque. Once we’d left the trucks we negotiated a few roundabouts and found ourselves on dedicated bike lanes which we were able to follow mostly all the way to the hotel. I’d chosen the Ibis hotel in Dunkirque which had a 24 hour check-in desk. Just as well as we didn’t arrive there until about 1:15am. We inspected the garage but didn’t see anywhere safe to lock the bikes, so folded them up and took them into the hotel. Getting to sleep posed no difficulty! 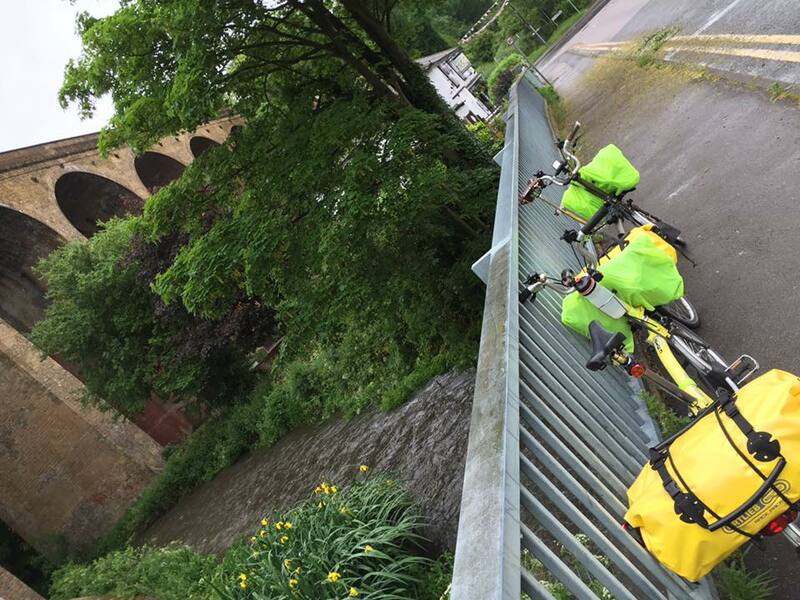 London to Dunkirque, 105.3 miles (169.5 km). Can you please tell me the size of your rear bike bag. Mine is a 24 litre Ortpieb rack pack, Jenny’s is 31 litres. I am interested in why you didn’t put the Rack Pack on the rack lengthwise to avoid heel strike. More on how the Rack Pack works with the Brompton. Seems like a perfect solution. You don’t get heel strike when it is fitted transversely. There are some notches underneath the rack towards the front that enable you hook the bungee cord underneath to keep the bag positioned at the back half of the rack. It only takes 10 seconds to secure the bag on. Have used this on a few adventures now including Berlin to London with no issues.